Parisians – Don’t Scowl at Me! 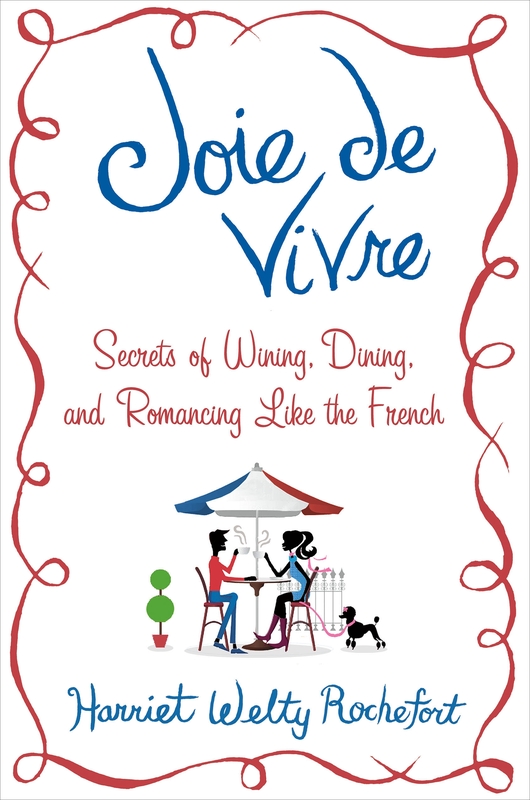 I preface this post with those comments lest my readers think I am “dumping on the French”. While I’m at it, I should also point out that I have never subscribed to the “all the French are arrogant” theory although I always thought and still do that SOME of the French are arrogant just as SOME of the Americans are loud. Now that I’ve taken the necessary precautions, I can get to the heart of the matter which is a question: Why do the Parisians scowl so much? Note I say “Parisians” and not “the French”. The minute you get on a train and get yourself to a provincial French town, you’ll encounter people who actually do smile and say Bonjour. Mais oui! But the Parisians….. It’s a well-known fact that the Parisians do not smile. Oh, they may smile at their children or their mother or their best friend but they do not walk around with the Universal Smile that is drummed into Americans from childhood. Yet although I know this fact, having lived here for 44 years with a French husband and two Franco-American children, none of whom practice the Universal Smile, I still am shocked by The Scowl. (It’s one thing not to smile, another to frown, glare and look positively malevolent). The Scowl is usually because the person is on the metro and it’s crowded and smelly and it’s not a smiley experience. The Scowl is because the person is engaged in his or her own thoughts and sees no reason to communicate with a total stranger. A Parisian waiter without a scowl would not be a Parisian waiter. You’re supposed to smile at him, not the other way around. The Scowl is NOT, as many Americans would have it, because you are not French. No, French people scowl at other French people, believe me. 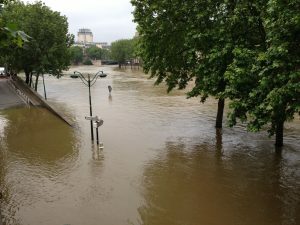 In recent days, the Parisians have had more to glower and groan about than usual: a weak and vacillating government, garbage, plane, train, and metro strikes, and even the flooding of the Seine after a triste month of grey rainy weather. Even I, the perpetually smiling American, am down at the mouth. The garbage strike exacerbated my bad humor. On a recent day I decided to take a walk from my apartment near the Place Gambetta in the east of Paris to the lovely verdant, hilly Parc des Buttes Chaumont. To my horror, the promenade consisted of avoiding the mounds of garbage piled up and all around the green city garbage bins parked on the sidewalks while trying not to smell the offensive odors that had collected after said garbage had rested there for more than a week. I refused to think about rats. 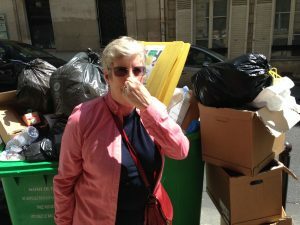 As I write this, the garbage strike is winding down, but the CGT (Confédération Générale du Travail, the Communist trade union) is still in a fight to the death battle with the Socialist government which it accuses of being too far on the right. (Imagine that in the U.S.!) Metros, planes and trains are still running – but not all of them as many workers are still on strike. (Why the strikes? Oh, I almost forgot: they are over a proposed labor reform law the unions rejected and which the government, weak as it is, promptly watered down – but not enough for the unions). The last stand, a huge demonstration on June 14, and continued strikes, is taking place in the midst of the Euro Cup which started on June 10 and has brought millions of tourists to France. The unions could have called a halt to the strikes during this period but that would have been so un-French. Best to let the visitors see what it’s like to live in a nation where “democracy” is equated with street protests. So there we are: plenty of reason to be grumpy. But, please, Parisians: it’s not my fault so don’t scowl at me! A Canadian friend and longtime resident of France holding her nose. This entry was posted in Uncategorized on June 12, 2016 by harriet.welty. This post started with a phone call from Radio Sputnik in Moscow. In case you didn’t know – I didn’t – Radio Sputnik in 2014 replaced the Voice of Russia. They don’t seem to have a Paris correspondent and, as I’m a former journalist and an author who has written extensively about the French and French life, they call me from time to time for comments on big stories. I’m always happy to help – and of course there’s always a lot to say. First, there were the terrorist attacks in Paris, in January 2015, then in November 2015. One at the beginning of the year, one as the year was drawing to an end. The first aimed at Charlie Hebdo and its cartoonists and journalists for their mockery of Islam. The second was a spree, targeting first a soccer match attended by French President François Hollande, secondly, innocents enjoying a balmy Fall evening on the terraces of cafés, and lastly, music-lovers gathered at the Bataclan concert hall. Both attacks were terrifying and horrific and for a time, the French united in sorrow and solidarity. But it was only a brief pause and little by little “real” life came back with a vengeance. People put terrorism in the back of their minds (although almost everyone on the metro subconsciously looks around for suspicious packages or suspicious behavior). Dissatisfaction with the Hollande government recently came to a head over a proposed labor reform which was rejected by the unions and Hollande’s own constituents. Hollande, they say, no longer represents the left. They took to the streets, camped out at the Place de la Republique, and in true French fashion went on strike. The strikes though – metro, trains, garbage and probably a few I’ve forgotten – turned ugly with hooligans and leftist extremists violently smashing shop windows and attacking the police. Protestors, led by the Communist trade union, blocked the oil refineries and soon gas stations had little to no gas. People had a hard time getting to work and businesses lost contracts and money. To add to the stress, May was a depressing, sun-deprived, rainy month – so rainy that the Seine rose to 6 meters, the highest in 30 years. In Paris, both the Orsay Museum and the Louvre closed their doors while workers scrambled to move artworks to higher floors. Outside Paris, damage was considerable and grave, leaving many people homeless and some of the great museums and castles endangered. The emblematic Chateau de Chambord, a Unesco World Heritage site, is surrounded by water. As I write this, the sun is out for the first time in days. The level of the Seine will lower. As for the strikes, who knows? They are an inevitable, and fatiguing, feature of French life. The Euro 2016 will start on June 10. Terrorism experts are on the alert, for how can you control “fan zones” where thousands of people are milling? Stress again! A somber picture? No, real life. The one that we had to get back to after the January and November tragedies. They haven’t been forgotten and shouldn’t be. Floods will happen, unpopular government measures will always occur, and terrorism shouldn’t be a fatality. All this being said, I simply hope the sun will continue to shine, the level of the waters will decrease, the strikes will stop (they will – summer vacation is right around the corner and I have NEVER seen anyone in this country strike in summer…), and terrorism will be eradicated. Wishful thinking perhaps, but pourquoi pas? One can always dream of a better world.